3 bedroom, 2 full baths, Sleeps 10. Cabin sits on 1.3 acres with good neighbors on both sides of the waterfront. Shady lot and a huge shady screen porch and large deck. The cabin sits on a peninsula and has 2 water views with 3 different docks. Located near Goat Island and the dam off Hwy 50. Very close car ride to Russell Crossroads and The Amp. By boat there are 4 great restaurants within a 15 minute boat ride. Also 3 marinas close by. The cabin has a maui-mat and a 2 person kayak for your use. I can't say enough good things about this house, the location, or the owner. We were evacuated from Panama City Beach after one day of our trip I feel blessed to have found this piece of paradise to spend the remaining days of our vacation. The owner was quick to respond and so nice to work with. The house is fully stocked, very clean, and views for days. This was our first trip to Lake Martin and Eclectic, AL but will not be our last. We enjoyed visiting the various islands and all of the restaurants John recommended were awesome. Both adults and kids agreed that we enjoyed our vacation at this lake and home more than the beach trip we had planned. We really enjoyed our stay over the weekend at this beautiful cabin on Lake Martin. Plenty of space for all of us and really liked having the screened in porch to take in the evenings. Convenient end of the lake but tucked away for privacy. I especially enjoyed not having to worry about our boat at the dock with very low wake activity in the slough. No worries about packing up the car the cabin comes well equipped with all the essentials. Will return in the near future. Great location on the south side of Lake Martin. Easy access to Anchor Bay Marina. Very relaxing cabin on the lake. We really enjoyed this lake house. It is in a great location close to Goat Island and Chimney Rock. The large screen in porch was a real bonus, we got to spend time in the evening enjoying the nice weather. 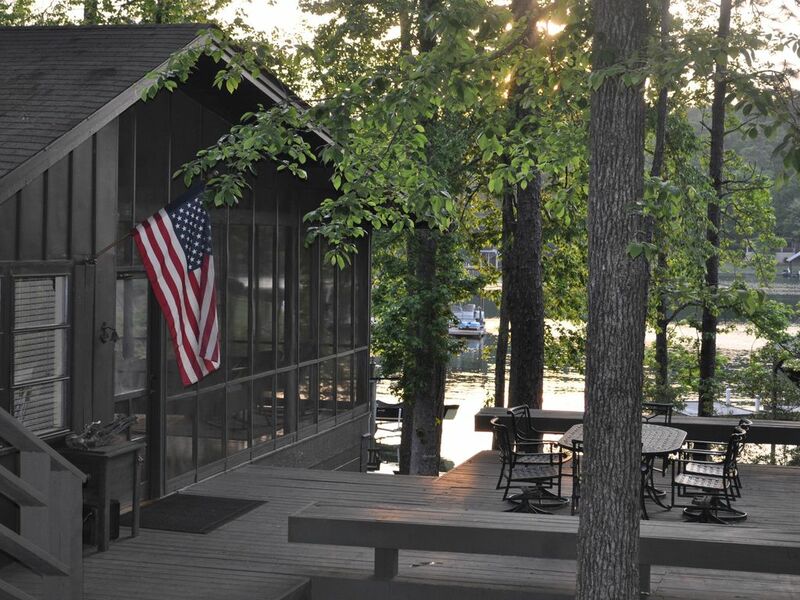 My family of 5 have a fabulous time at this cabin on lake Martin. It was quiet and very much put us in a home-like atmosphere. We felt right at home the minute we walked in with all the amenities necessary. We especially enjoyed the screen porch both its comfort and views to either side of the point. The docks were fabulous for sunning and swimming and the cove was good for using the kayaks. I highly recommend . Our summer family get together was full of fun at Lake Martin. The cabin was beautifully situated. With its proximity to goat island, chimney rock, and marina, we rented a boat for tubing. The kids had a blast on the maui mat and the porch enlarged the living space to accommodate eating and card games long into the evening. Many Thanks!